The first thing you should do after installing WP Statistics is configure the plug-in, this is accomplished through the settings page. At the top are nine tabs, each one will be addressed separately. The General Settings page has 9 subsections to it; Users Online, Visits, Visitors, Pages, Miscellaneous, Search Engines, Charts, Map and Statistical reporting. The IP Addresses section contains the configuration items IP storage in WP Statistics. Note has a long term impact to your site. This feature will not store IP addresses in the database but instead used a unique hash. The “Store entire user agent string” setting will be disabled if this is selected. You will not be able to recover the IP addresses in the future to recover location information if this is enabled. Once enabled all new visitors to your site will have their IP addresses stored as a hash, however previous visits will not be converted and you may want to purge your old data. You can also got to Statistics->Optimization->Updates and select “Hash IP Addresses” to update old entires in the database. The Users Online section contains the configuration items tracking online users in WP Statistics. This enables/disables the tracking of users that are online for your site. If you have enabled Users Online tracking, this is how often they are checked for. If a user has not visited a page within this number of seconds, they will be considered offline. Ignores the exclusion settings and records all users that are online (including self referrals and robots). Should only be used for troubleshooting. The Visits section contains the configuration items for tracking visits (hits) to your site. The Visitors section contains the configuration items for the visitor tracking for your site. This enables/disables the tracking of visitors for your site. If you have enabled Visitors, by default it stores the browser make, version and platform in the database by parsing the user agent (UA) string. However UA strings are very complex and parsing sometimes does not work correctly. You can store the entire UA string in the database so that it can used to troubleshoot issues. This is the number of hits each visitor records for. Usually is 1, however if you have another plug-in that causes visitors to effectively connect to to your site more than once for each page view, this can be set to a lower value to account for that. The Pages section contains the configuration items for the page tracking code. This enables/disables the tracking of individual page hits. By default, page tracking only tracks WordPress pages and posts, however you can enabled tracking of all pages (like category pages, RSS feeds, etc.) with this option. Note: this will significantly increase the pages table and may make the top pages chart less useful as many system pages will likely be near the top. By default the page tracking code tracks every unique URI, including the parameters after the ?. This can cause the same page to be tracked as multiple unique URI’s which may not be appropriate. This option cannot be activated if you are using the default setting for permalinks in WordPress. Likewise if your permalink setting contains a ? then this option will not be available. You should only enable this option if you fully understand the consequences. For example, the default behaviour of WP Statistics is to track multi-page posts separately so you can see if a user reads more than one page. Enabling this option will not track these pages separately. By default, if Pages is enabled, WP Statistics will add a column to the post and pages lists in WordPress and display the number of hits each one has had. This does have a performance impact and this option will disable this behaviour. The Miscellaneous section contains configuration items for WP Statistics. This enables/disables the admin menu bar for WP Statistics. Note: As the WP Statistics menu bar displays visitor stats, it adds load to your database for each admin page load. By default, WP Statistics will warn you about any primary features that have been disabled (Online Users, Visits, Visitors, Pages and GeoIP). If you have disabled a feature on purpose or cannot support the GeoIP code, this option will remove the warning. By default WP Statistics stores the admin manual in the plugin directory (~5 meg), if this option is enabled it will be deleted now and during upgrades in the future. The Search Engines section contains the options for which search engines you want to track as well as controlling search quires that do not contain any values. By default all supported search engines are enabled, you may disable individual ones as required. Note however that disabling all search engines is not allowed, doing so will result in all search engines being active. If a search engine is identified as the referrer but it does not include the search query this option will substitute the page title in quotes preceded by “~:” as the search query to help identify what the user may have been searching for. Also note that geographic versions of the search engines are supported, so Google will include google.com as well as google.ca and other variations. The search engine list can be found in wp-statistics\includes\functions\functions.php in the function called wp_statistics_searchengine_list() (should be around line 297). You can add additional search engines by editing the $engines array, details are contained in the comments above the function. All other aspects of the search engine code relies on this array and no other aspects of WP Statistics needs to be changed to support the addition or removal of search engines. The Charts section contains the options for the display of charts in WP Statistics. The Languages section contains the options for the language used in WP Statistics. By default WP Statistics uses the language that the WordPress administrative console is set to to display all strings. This setting will override that behaviour and instead use English. The Common Report Options section contains options that are common to all of the sections that follow. This is a comma separated list of e-mail addresses to send the report too if e-mail was selected in the option above. By default this will be the WordPress admin e-mail address. The Update Reports section contains options for when to send e-mail notifications when various update actions occur. Send a report whenever the browscap.ini is updated. See the browscap tab to enable automatic updates. Send a report whenever the GeoIP database is updated. See the GeoIP tab to enable automatic updates. Send a report whenever the pruning of database is run. See the Maintenance tab to enable automatic pruning. The Statistical Reporting section contains the options to email the administrators the statistics. Note if reporting is disabled, all other related fields will be hidden in the user interface. How often to send the report. How to send the report, the blog’s admin email address is used if email is selected. To support SMS you must have WordPress SMS (http://wordpress.org/plug-ins/wp-sms/) installed as well. This is the report text which will be sent, you can use any short codes supported by your installation of WordPress, including the ones from WP Statistics. As of WP Statistics 8.0 the old variables have been removed and the upgrade process will automatically replace them with the appropriate short codes. 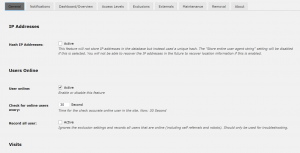 The Overview page has 3 subsections to it; Map, Post/Page Editor and Widgets to Display. The Dashboard section contains the options for the display of the dashboard widgets. If you wish to disable the dashboard widgets for all users, you can do so by enabling this option. The Post/Page Editor section contains the option for the widget on the post/page editor in WordPress. WP Statistics will include a 20 days page hit chart on the post and page editor screens in WordPress. This option will disable this for your site. The Maps section contains the options for the display of the GeoIP map in the overview page of WP Statistics. By default the map is displayed in the overview page, however it can be disabled with this option. The Access Levels page has 1 subsections to it; Access Levels. The Access Levels section contains the settings to control who can view and manage the WP Statistics plug-in. What roles are available to set is dependent on your installation of WordPress, some plug-ins add roles. Note, each of the above cascades the rights upwards in the default WordPress configuration. So for example selecting publish_posts grants the right to Authors, Editors, Admins and Super Admins. For more information about WordPress roles, you can visit the “WordPress Roles and Capabilities” page at http://codex.wordpress.org/Roles_and_Capabilities. There are also several good plug-ins to extend the roles and capabilities of WordPress, one such plug-in is Capability Manager Enhanced (http://wordpress.org/plug-ins/capability-manager-enhanced/). This will be the minimum role required to access the statistics pages. This will not provide access to the settings or optimization pages. This will be the minimum role required to fully administrate WP Statistics. The Exclusions page has 6 subsections to it; Exclusions, Excluded User Roles, IP/Robot Exclusions, GeoIP Exclusions, Host Exclusions and Site URL Exclusions. The Exclusions section contains the settings to control if exclusions are recorded or not. If a page hit is excluded for any of the settings in the next several sections it is dropped silently by default. This setting will enable aggregate recording of these exclusions so you can track spikes in the different types of exclusions. The Exclude User Roles section contains the settings to control if different user roles are excluded from the statistics. Note, by default WordPress comes with the following roles, however plug-ins can extend the roles available so you may see a different list in your installation. Also, the Everyone role is excluded from this list as excluding it would effectively disable WP Statistics. WP Statistics builds this list dynamically, if you are writing a plug-in that adds a role to WordPress you do not need to make any changes to WP Statistics to have it supported. The IP/Robot Exclusions section contains the settings to control if IP subnets and Robots are excluded from the statistics. A list of words (one per line) to match against to detect robots. Entries must be at least 4 characters long or they will be ignored. By default, when WP Statistics is upgraded, if this list has not been altered, new robots will be automatically added. However if you have added your own robots to the list, you will have to manually add any new entries (which can be found in the upgrade section of the readme) to this list. Force the robot list to be reset to the default after an update to WP Statistics takes place. Note if this option is enabled any custom robots you have added to the list will be lost. Treat visitors with more than this number of visits per day as robots. 0 = disabled. Be careful of setting this number too low as you may exclude too many people from the statistics. A list of IP addresses and subnet masks (one per line) to exclude from statistics collection (both 192.168.0.0/24 and 192.168.0.0/255.255.255.0 formats are accepted). To specify an IP address only, use a subnet value of 32 or 255.255.255.255. IPv6 addresses can also be added in the format of fc00::/7. WARNING: This is a VERY powerful feature which can be miss configured to exclude too many hits. Be careful to use the right subnet for the addresses you want to exclude. WP Statistics can use a honey pot trap page which normal visitors will never visit to identify robots and crawlers. Once identified, hits from these visitors will be excluded for the rest of the day. The post ID of the page/post you wish to use as the honey pot, a hidden link will be added near the bottom of each page on your site. Users will not see this link but crawlers which simply parse the HTML will and then follow it. WP Statistics can create a new honey pot post by simply checking the “Create a new honey pot page” option. If WP Statistics finds corrupt or missing information for the IP address or User Agent string, enabling this option will exclude the visitor/visit from the statistics. The GeoIP Exclusions section contains the settings to control if hits are excluded based on their GeoIP information from the statistics. A list of country codes (one per line, two letters each) to exclude from statistics collection. Use “000” (three zeros) to exclude unknown countries. A list of country codes (one per line, two letters each) to include in statistics collection, if this list is not empty, only visitors from the included countries will be recorded. The Host Exclusions section contains the settings to control if hits are excluded based on their host name information. A list of fully qualified host names (ie. server.example.com, one per line) to exclude from statistics collection. Note: this option will NOT perform a reverse DNS lookup on each page load but instead cache the IP address for the provided hostnames for one hour. If you are excluding dynamically assigned hosts you may find some degree of overlap when the host changes it’s IP address and when the cache is updated resulting in some hits recorded. The Site URL Exclusions section contains the settings to control if some of the WordPress pages are excluded from the statistics. Note, self referrals from your own site are ALWAYS excluded from the stats. These are most commonly ajax requests by WordPress. Exclude all RSS pages from the statistics. This includes the primary site feed as well as individual post comment feeds. It should also include any custom RSS feeds that have been configured for your WordPress install. Exclude any URL that returns a “404 – Not Found” message. Exclude any call to the WordPress AJAX system. A list of URL’s (one per line) to exclude from the statistics collection. These should NOT include any GET parameters they may not match the URL you expect. The Externals page contains the settings to control the optional third party services, including GeoIP data collection, browscap robot exclusions and Piwik Referrer Spam Blacklist. The GeoIP settings allow you to configure the recording of country information for your visitors. This requires the download and use of an external database and is disabled by default. Note: IP location services provided by GeoLite2 data created by MaxMind, available from http://www.maxmind.com. Note: Referrer spam blacklist is provided by Piwik, available from https://github.com/piwik/referrer-spam-blacklist. Enable/disable the collection of GeoIP information. The GeoIP database is updated monthly by MaxMind, checking this option and saving the settings will download the latest database. If you want to manually download the database, you can do so and store it in wordpress/wp-content/upload/wp-statistics. Make sure to decompress it. WP Statistics can automatically download the new database each month by enabling this option. Download of the GeoIP database will be scheduled for 2 days after the first Tuesday of the month (which is when the new database is released by MaxMind). After an update to the database is done, you can have WP Statistics automatically try and find missing geolocation information for visitors in the database. The international standard two letter country code (ie. US = United States, CA = Canada, etc.) for private (non-routable) IP addresses (ie. 10.0.0.1, 192.158.1.1, 127.0.0.1, etc.). Use “000” (three zeros) to use “Unknown” as the country code. The browscap page contains the settings to control the use of the browscap.ini file for robot detection. More information about browscap.ini can be found at browscap.org. The browscap.ini database is used to detect robots and crawlers to your site, however the normal distribution is quite large as it can identify any browser, not just robots. To use the normal distribution of browscap would require and additional 5-6 meg of ram per page load. To avoid this, WP Statistics will process the browscap.ini file and strip out all non-robot based entries. This reduces the overhead to approximately 200k per page load. However there must be enough free disk space available to download and process the complete browscap.ini file. Enable/disable the use of the browscap.ini file. The browscap.ini file is update on an irregular basis, checking this option and saving the settings will download the latest file. Manually downloading the database is not recommended as it is quite large and WP Statistics removes unused items from it for performance reasons. WP Statistics can automatically download the new browscap.ini file on a weekly basis by enabling this option. Referrer spam is unwanted hits to your site by robots that impersonate users trying to insert spam links to your statsitcs, Piwik maintains a list of sites that use this technique and WP Statistics can exclude these from the data collection. Enable/disable the use of the Piwik Referrer Spam Blacklist. The Piwik Referrer Spam Blacklist file is update on a weekly basis, checking this option and saving the settings will download the latest file immediately. The Piwik Referrer Spam Blacklist file is update on a weekly basis, checking this option and saving the settings will download the latest file each week. The Database Maintenance page contains the settings to control if the database is pruned of older data. Enable/disable the running of a daily job to prune the database of old data. Since WP Statistics 8.2 the pruned data will be summarized in to the historical database. The number of days to keep statistics for. Minimum value is 30 days. This means a number above 30 must be entered here. Invalid values will disable the daily maintenance. Enable/disable the running of a daily job to prune the database of visitors with more than a dfined number of hits per day. These hits will be removed and not added to the historical database. The number of hits to remove statistics for. Minimum value is 10 hits. The Removal page allows you to remove the data and settings before uninstalling the plugin. Reset the plugin options to the defaults. This will remove all user and global settings but will keep all other data. This action cannot be undone. Note: For multi-site installs this will reset all sites to the defaults. Remove data and settings, this action cannot be undone. The About page contains version information and other details of the plugin you may find useful.